When an Elvis system fails for some reason and thereby becomes unavailable, it is important that production is affected as little as possible. A typical way of overcoming this is by temporarily setting up an additional system to take over the role of the failed system. As with any system, the installed Elvis installation on this system needs to be activated. Typically though, the regular activations are tied to the inaccessible failed system and therefore cannot be used. For this purpose therefore, a temporary license — referred to as a 'Backup license' — can be used during the period in which the failed system is repaired. Once the failed system is working again, it can be taken into production and the additional system can be brought down. In case the failed system cannot be repaired and the additional system is going to be used as the new production system, a request can be made to WoodWing to release the activations on the failed system so that they can be activated on the other system. A Backup license is available as part of a Premium or Ultimate Elvis Server license, or can be purchased separately. A Backup license will expire 30 days after activation and can be extended on request. Example: You receive the license from WoodWing on April 1 and activate it on April 15. The license is then valid for 30 days starting on April 15. 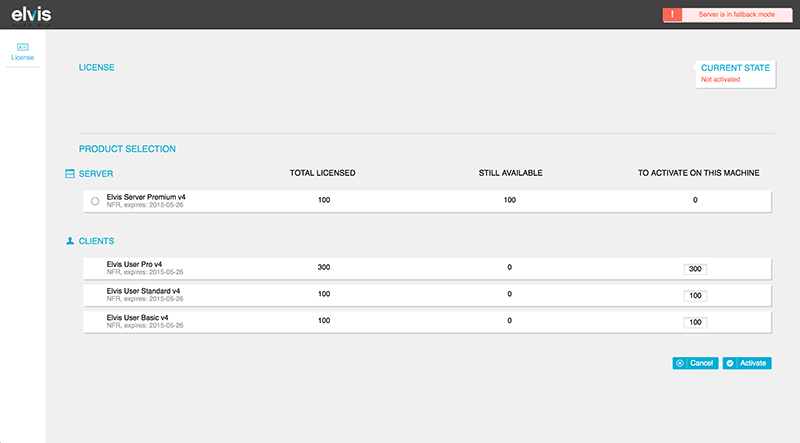 Activating a Backup license is done in the same way as a regular license by using the License page in Elvis Server. The license will have 'backup' in its description. Follow the steps as described in Licensing Elvis 6 Server and make sure to set the number of regular licenses to activate to zero. A Backup license can only be activated on a system on which the regular licenses are not activated. Once deactivated, a Backup license cannot be activated again. In case the failed system cannot be accessed at all any more and it still contains activated licenses, these licenses can be used on another system such as the temporary system that was used. Before this can be done, the license information needs to be adjusted on WoodWing's side. Contact your WoodWing partner or WoodWing Sales to arrange this. Once the adjustment has been made, the licenses can be activated in the regular way on another system.